April | 2010 | i'm on an adventure! Last night I attended this really awesome fundraiser! It was called “A Night of Rhythm and Breath” and we participated in an African dance workshop followed by some transformational breathing. The event was raising money for Alzheimer’s research and our friend Allan O’Meara, who I met through the Vancouver Hug Squad. Allan is leaving in September to climb Mt. Kilimanjaro for the cause (SIDENOTE: this reminded me a little bit of Greg Mortenson’s story which you can read about in his book “Three Cups of Tea“, I don’t really enjoy mountain climbing stories so I thought the first half was very boring but if you like that sort of thing i’m sure you’ll enjoy it). The second part of the night was a transformational breathing session led by Dale Joyal. Before we started they kind of warned us about how intense it can be. I half expected to work through all these deep emotional issues and come out a different person. I think this experience really showed me how little I have to worry about and how blessed I have been in life. I don’t really know why I expected to work through deep emotional issues because to tell the truth I don’t think I have any right now. I have accepted things that have happened to me in the past and most of them have since become non-issues anyway. I think it’s one of those things where at the time something feels like the end of the world. To quote 17 Again, “When you’re young everything feels like the end of the world. But it’s not; it’s just the beginning.” (SIDENOTE: This movie is HILARIOUS, i’ve seen it 5 times but my goal is to get to 17 so if you ever wanna watch it just lemme know). I can’t describe the actual process of transformational breathing too much because I think you need to experience it to really understand. I felt very relaxed after… and cold… but i’m always cold haha. I fully encourage and support alternative health remedies like this. Dale described it to us as “oxygen therapy” at one point. I think it would be especially beneficial for singers, as breath support and breathing are they keys to an amazing voice. 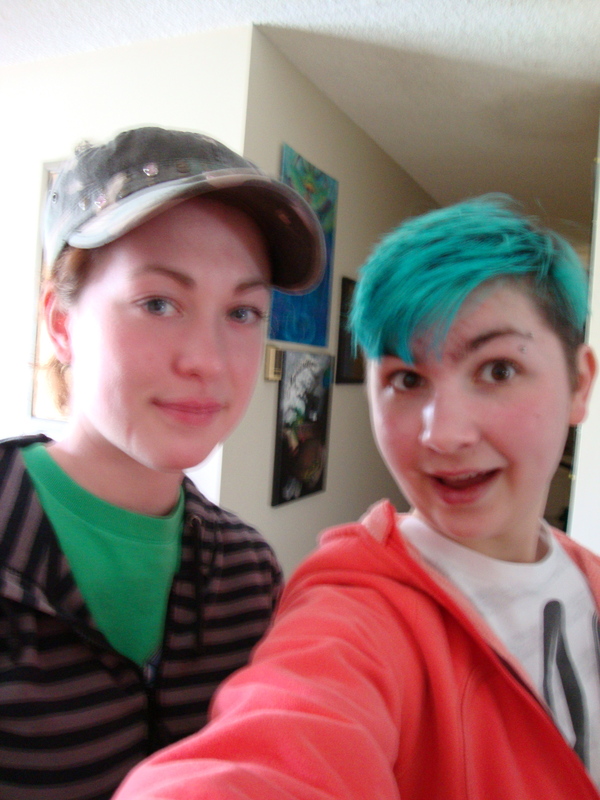 Today I got my hair cut and then my friend Alana dyed it for me with her awesome artistic skills. I’m not entirely sure, but it’s possible I have a mohawk. The sides are a tad shorter than I wanted but they’ll grow in. I find the cut a little butch but whatev’s. The colour is sweet! My turquoise dye has been finished off so when this fades out I can go in a new direction. Saw this on the skytrain tonight. I concur. the world is a small room. For every difficult problem: a proof. How deeply you’re connected to my soul? This is so cheesy, but when I heard it it was beautiful and sincere. Love it, and you! I went with my friend Tanisha to see the exhibit “Leonardo da Vinci: The Mechanics of Man”. To be honest I was expecting much more. They had just taken a bunch of pages from his notebook a framed them. I think if DaVinci (a very paranoid and private person to my understanding) could see it he would have a heart attack. I’m glad i went though. We only got to see one other exhibit because all the upper floors were in transition. Afterwards we went to Urban Outfitters to see the book/weird stuff section. There are always so many entertaining things there! When I got home I really wanted to make goma-ae (Japanese spinach salad with sesame sauce) but I didn’t have the ingredients so I walked to the grocery store. When I got to the checkout I realized I had left my wallet at home. Yay! Luckily my Mom was able to come bale me out. I love Mothers : ) Tell yours that. Now! I used this recipe from Bento Filler and made a few adaptions. 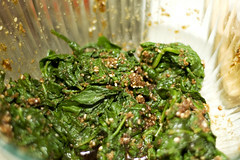 1/2 pound of raw spinach, cooked. Bring a pot of water to the boil. Put the spinach leaves in the pot all at once. If you have baby leaves (they are round and small and not crinkled), boil them for 30 seconds and not any longer. If you have fully grown leaves, boil them for about a minute. Immediately drain the pot. Run cold water over the leaves to cool them off fast. Drain. Take the spinach leaves in your hands and squeeze out the water as much as you can. If you don’t have pre-toasted sesame seeds (irigoma), toast the seeds briefly in a small dry frying pan. Crush in a small mortar and pestle or suribachi. Add the sugar and crush some more. Add the mirin and soy sauce and mix. Mix with the spinach. YUM. Here’s the link to get tickets. Text someone “i love you”.